Sinclair 2K is an outdated robot who first appears in a dream Bender has. He's also seen at the Big Robot Party [4ACV08] and is listed on the Robot Devil's "Wheel of Robots", [4ACV18] so he's apparently not only a figment of Bender's imagination. 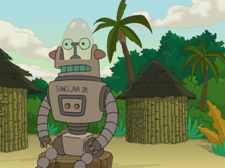 In Bender's dream, he lives on an island with outdated robots and has very poor memory - his memory is so bad that he forgot what his wife looks like. Sinclair 2K, like the other outdated robots refuses to be upgraded and so is usless in modern society, leading to his fleeing to the island. It is not known if this is just Bender's dream or if he lives on the island. Cartridge Unit, fellow island occupant. Cymbal-Banging Monkey, fellow island occupant. His design is most likely a reference to Robby the Robot from the 1956 science-fiction film Forbidden Planet. His name is probably an allusion to the Timex Sinclair 1000 home computer, released in 1982, which had 2 kB of memory. Sinclair: Oh, great. Now I remember that word but I forgot my wife's face. Bender: Try again Sinclair, I said target Robot 1-X. Sinclair: Who's Robot 1-X? Launching.